You are here: Home > T-Mobile G2X Dropping April 15th? Maybe. T-Mobile G2X Dropping April 15th? Maybe. While we’ll ignore for a moment the fact that T-Mobile has yet to release any sort of information regarding a release date for the T-Mobile G2X new information pinpoints to a April 15th launch. That’s 5 days ahead of our own timeframe of April 20th which we’ve been working with for a while now. Anyone have any objections to the G2X releasing a little early? Didn’t think so. Noticeably absent here is the release date of the T-Mobile G-Slate which is only marked as “soon.” Our own intel pinpointed the G-Slate to release on the 20th along with the G2X so we’ll keep that as a possibility. We should note that I can’t recall in recent times when T-Mobile has launched a device on a Friday so we’ll definitely pencil the 15th in and hold fast on the 20th until we get something a little more concrete. Of course, maybe T-Mobile will shock us and actually announce a date in the coming days. Hopefully they do so T-Mobile and LG can get some sales going! What the hell is it with Tmo not announcing these new phones when they are supposedly this close to release!!?? Probably coz the dates are subject to change and TMobile doesn’t want to hurt sales of phones that are available. 2Gx or the Slate, decisions! On another note, is there any rumor of an Evo 3D looking phone for TMobile? It would probably not have the Evo name and I don’t care much about the 3D, but the phone looks real nice. Would like to have something that looks like that instead of the Pyramid on the Magenta side. The Evo 3D GSM rumor was shot down as a mere error on the site. “EVO” is a brand name that belongs to Sprint, same as “Droid” to Verizon and just like “G” “MyTouch” and “SideKick” belong to Tmobile NOT the phone manufacturers. The HTC Pyramid is more or less the same thing as the EVO 3D. 700 bucks just sitting in the bank for 2 months now, yelling at me to SPEND!!!! everytime i check my account. c’mon tmo!!! you might get bought by someone before you actually release this phone. Hi, I’m with your bank. There’s been a possible security breach and we need to verify your ATM Machine Debit Card number and PIN Number. Please also, sir, to be humbled, to send a copy of your drivers license and your birth certificate. Upon receipt, we will transfer $10,000,000 into your account from your dead prince uncle in Uzbeckistan. Asides from that, that leaves me more time.. as if it comes sooner I have less to wait for it to hit Ebay haha.. got around $450 waiting to find one, also.. gotta wait for it to drop a little.. unless it launches for $499 unsubsidized. Where is the HTC Pyramid? Okay I have seen the release as being the 20th, 23rd, and 28th. All posted by people who claim to work for tmobile and now we proof it’s coming on the 15th. Things that make you hmmm. I think I’m usually a pretty good source for information and I’m sticking with the 20th. Though I did just see something that says the 28th but that again makes me skeptical as this image does because thats a Thursday and T-Mobile releases phones during the week on Wednesdays. I know, I could be wrong though, I want to be wrong but history tells me they release phones on a Wednesday. That’s the only reason I’m skeptical. I won’t be upset either way. The 15 is just closer. Everyday my friends ask me “David, did you get your new phone yet?” & I’m like “No…. -_-, soon…”, lol. I remember one time I went for like periods of 7-8 months without a phone. Idk if I can do that no more, now that I’ve really got into Smartphone & with Android’s existence. The Astound came out today, a Wednesday. wow, i appologize. could have sworn i saw tmo on twitter say astound was out yesterday. I heard from 2 reps 4/13…which is a Wednesday…FREE ME FROM THIS MYTOUCH 3G!!! I think it’ll drop this month sometime…..The Slate is listed at the bottom of that sheet (after devices launching in May)…I hope the Slate doesn’t launch in May!!!! I just got off the phone with a rep at a Tmo store and a rep in the Tmo cancellation department (negotiating early upgrade) and both of them quoted 4/13 (Wednesday) as the G2x release date. The Tmo rep in customer support said she saw it earlier in the day in the computer system but it suddenly changed to “TBD” when she looked again. Cross your fingers. that is bull i am a tmobile rep and they have NOT gave us a release date yet. *Was just about to send you all this* Guess someone is faster than me. I have no objections to this date. The sooner, the better. Anyone have any objections, speak now or forever hold your peace, lol. Didn’t think so..
Hey, I’m simply amazed the TMO is releasing such a device at all. Bring it on. Nice upgrade from my Nexus One. I’ll take stock OS over a Pyramid any day. yea you can wish it goes to other carriers but there is no sign of that at all right now. Nice upgrade from the N1… I’m still pushing the G1 until this comes out. I’m impressed you’ve been able to deal with the G1 and how slow it is this long. I got the Nexus One at release and like tmonewtn, I am ready to upgrade to the G2X now! I wish TMO would stop jerkin’ their gherkin and give us a date and a price. Is this a document given to reps? Probably yeah, looks like a document given to the ppl working for Tmobile, i can’t wait to get this phone…shoot me plz. wat the hell is the after hours promo on top of the picture???! carly is at the back of the store wearing next to nothing giving out gs4g to employees. I was on their website a couple days ago and it showed the Sidekick 4g, then the Tmobile 4g Hotspot, then then Tmobile G2x in that order. So I figured the G2x was coming out a little later. Now that this post is up, I see that the G2x is before the Tmobile Hotspot and the Sidekick 4g. So this could be a little hint that the G2x will be released on the 15th. But I guess we will have to wait until then to see whats up with that. What i wonder is why the sidekick 4g is not on that list. I remember the post back saying the sidekick was out on the 20th or what was leaked. So why is it not on that list. I guess i have to wait and see if i see this list tomorrow at work. I haven’t been keeping up to date but is this G2X the successor to the G2? Yes and no… It doesn’t have the physical keyboard like the G1 and G2, but it does offer the Google “Vanilla” experience which is the pure Android with no flash extra skins like HTC’s sense. I think that is why they stuck with the G up front. The 2X more than likely represents the dual core processor that is has. That’s my take on it from the info I have read, mostly here. It’s not a successor but it definitely is an upgrade in comparison to the G2, but think of the x as the version without a keyboard, although this isn’t by HTC.. and it’s specs are much better than the G2’s. Has the price been released anywhere yet? I would be nice to know how much stuff I need to sell so I’m ready to go on the 13th, or 15th or 20th or what ever the date is that the G2X is coming out… It’s time to retire my well abused G1 that I got on day one of its release back in 2008. Both my G1s are tired. One is so banged up you can drop a penny through the case. The other one has had an Invishield on it from day one, but I finally cracked the camera cover… darn. CM6.1 is the only reason I have kept them running. Suppose I should spring for the G2X or wait ‘just a little bit longer for’ something cooler? Me, I’m ready to jump in it. Oh, do you suppose Loyalty will make me an offer? I’m a 6 year subscriber anbd my plans expired in December… I can go anywhere, just don’t tell them I refuse to go to VZW, Sprint is useless to me, and AT&T lost me in 2006 and I am in no hurry to go back. Guess that leaves me with cans and string as an alternative. Yeah, CM6.1 is the only reason I’m staying strong with my G1 as well. I have been thinking about the Pyramid but I’m just not sure I can wait any longer and if it has been pushed back to May, it may get pushed back further. Plus after running CM6.1 I have to have Android “Vanilla”. Really the only difference with the Pyramid that has me enticed is the qHD screen, that’s it. The price on that sheet for the Astound is wrong. it says 129.99 after 50MIR which to me means that is the price after it is 129.99 after the 50 not before. If it was before then that would be right, but whatever i work in a few hours so i will find out if this sheet is seating at my work or in my email. Whats the point, we have to get att phones when this deal happens. Ill waitand save my money for a company that will be around in a year. haven’t you read… this phone has bands that are available for both networks. You sure about that? Got any proof? I will be in the store the day it is released! ive been looking at that picture closely and noticed something.. does the background behind the text supposed to look differently than the rest of the background.. it looks more pixelated as if it was tampered with. can someone with gimp/photoshop check it out? maybe im trippin but it doesnt look right as if something was pasted in. ok can we get an Optimus 3d with that pleeeeeeeeeaaaaaaaaaassssssssssssseeeeeeeeeeeee! What’s the best way to get this phone when it comes out? Do they do preorders once a release date is officially released, or is showing up at the store early on release date the only way? Damn those reps…making up dates to get commission. The official 15th launch online is better than the 20th though. Rush shipping might be worth it. 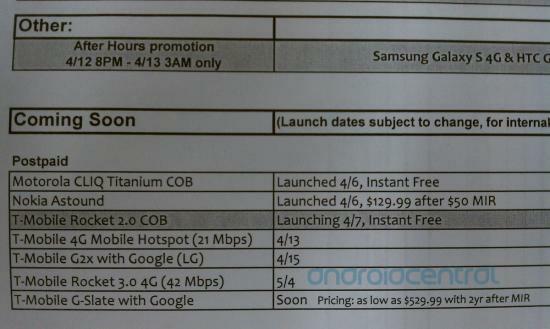 I have a FaceBook post from T-Mobile that says it will be released online on April 15, and in store on April 20. Can someone edumicate me on something? What does Vanilla Android mean? I run a year-round youth sports league using Google Voice and Gmail. I also need a bigger screen than the Blackberry I have to view 25+ page .pdf league team rosters. I usually delete games off a phone when I get it because I am prone to be easily distracted. I can’t get a Google Nexus phone yet because Best Buy won’t reduce price until your T-Mobile contract has expired. I still have almost a year left on my current T-Mobile contract, BUT their Retention Department will let me get the G2x for $199 AND waive one month’s worth of my contract fees ($90). That would essentially get me into the G2x for $100. Do I get it or wait for the Samsung Galaxy II or HTC phone? I really don’t HAVE to get a phone right now, because we are running basketball at the moment and I have my laptop connected wirelessly in the gym. I just need it by the time fall soccer starts. Need good clean GVoice and Gmail intergration. Don’t want a bunch of extra junk on the phone as I am just gonna delete it. Flash Player would be nice so I can watch my beloved Orlando Magic video highlights. OH! Really want LED notification when a new text or email comes in. LOVE that on my Blackberry. vanilla android is android in its most basic form. no bloatware and no prorietary ui like sense or touchwiz. If you don’t understand the comment below— Vanilla Android is pretty much just basic android- there’s no skin placed over the software that changes its appearance, possibly slowing it down. There are also no apps added onto the phone besides what they’ve listed (because on other “non-vanilla” interfaces it is difficult to delete these apps). And I am going to get this phone. You will love it over your Bberry- Android is the way to go. This phone will be one of the new phones on the market that are as close to a computer as you can get. Since Android is made by Google, anything that you use on it, e.g. GVoice, GMail, etc., will work great. You can also use this phone as a wifi hotspot. P.S….I’m on the same boat with the retention department. Gotta love em!! !